If you're like many Americans, the winter holiday season is likely one of the most costly times of year, particularly in terms of your monthly power bill. With the cold weather, holiday dinners, family gatherings and hours watching holiday movies or football – not to mention energy-intensive decorations throughout the month – most families will see a considerable spike in their energy usage and the accompanying cost. Fortunately, there are many ways in which you can easily reduce your energy usage around the holiday season -- without sacrificing any of the joy of the season. A smart thermostat could keep your home at comfortable temperature much more efficiently. Or you could choose to physically winterize your home by adding things like weather strips around drafty windows and doors. But, one of the most cost-effective ways to reduce your power bill – and, conveniently, one of the easiest to do yourself -- is to upgrade your holiday lighting to the most energy-efficient technologies. The old-school Christmas lights from years past are extremely inefficient and -- as I'm sure you're well aware -- tend to be thrown out after half of the strand mysteriously won't light. Innovations in lighting over the past decade, however, mean that there are much better options out there. ENERGY STAR®-qualified LED lights, for example, will use about 70-80 percent less energy than the traditional incandescent lights. The LEDs have other benefits as well. They typically last about 10 times longer than incandescent bulbs, and since they run cooler, they’re much less of a fire hazard than the traditional Christmas lights. If you want to see how much you can potentially save by making the switch to LEDs, check out the Holiday Lighting Calculator from Duke Energy, a large electric utility that has operations in North Carolina, Kentucky and a handful of other states. While the calculator should only be used for estimations (how much you save will vary depending on the electric rate you pay), it’s pretty easy to see how cost effective LED holiday lights actually are. For example, you could run 10 strands of the mini LED lights for 12 hours per day at a cost of only $0.08 per day! Even over a whole month of use, the total cost of running this amount of mini LEDs adds up to only $2.41. In contrast, using 10 strands of medium-sized incandescent lights for 12 hours each day adds up to about six bucks each day and $180 for a month. Also, keep in mind that the long operational lives of LED lights could be where you expect to save the most. With LED lights, you won’t need to continually replace the light strands you have. 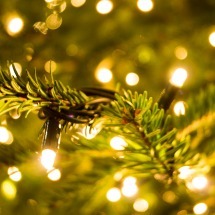 Traditional holiday lighting is expected to last about three reasons on average, whereas LED lights could last a decade or more. Even though the winter holiday season will soon be over whether we want it to be or not, the lessons learned on energy-efficient lighting can be easily applied to the rest of the year. In most homes, lighting accounts for between 10-15 percent of annual electricity usage, and considering LED bulbs use anywhere between 70-80 percent less energy, this can add up to substantial savings over time. According to a cost analysis conducted in the summer of 2017 by a nonprofit consumer organization, the typical American household can expect to save $1,000 over 10 years by making the switch – and this includes the cost of the LED bulbs, which is still somewhat higher. That’s roughly $8.33 each month – not bad for just changing a few bulbs. Finally, whether you’re looking for holiday lighting or just to upgrade your normal, year-round household lighting, you may want to check with your local electric utility for any additional discounts. Many electric utilities offer rebates for their customers to purchase energy-efficient lighting, and with some utilities, like Chicago-based ComEd, you may be able to purchase them online through a quick-and-easy, Amazon-like experience. 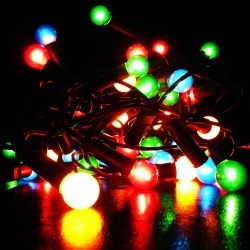 Currently on the ComEd Marketplace, for example, LED string lights are discounted $3 for each box. These lights are rated for 100,000 hours of use, are ENERGY STAR certified and even have a manufacturer’s warranty for three years. For normal-use light bulbs, the current deals are even better. A pack of six Phillips 60-watt equivalent LEDs, for example, is currently available for $18 after an immediate $18 discount! Over the past decade, LED lighting has come a long way toward being a cheaper, better quality and much more efficient alternative. If you haven’t made the switch yet, this winter holiday season could be the time to do so. Looking for more info on LED lighting? Read the Department of Energy’s blog post, “Top 8 Things You Didn’t Know about LEDs”, here. Want more information on online marketplaces from electric utilities? Check out our recent blog post, “Is Your Utility the New Amazon for Energy?”, here.